Director Andy Serkis’ long-shelved, studio-swapped cinematic adaptation of Rudyard Kipling’s masterpiece The Jungle Book isn’t your grandparents’ version of the tale. It’s not even your parents’ – and it’s definitely not your toddler’s either. MOWGLI: LEGEND OF THE JUNGLE is a visually beguiling, coming-of-age adventure about a boy finding his place in the world that turns convention on its head. The auteur throws out the sanitized, Disney-fied iterations of the past, favoring a darker, more faithful retelling of the literary classic. He, along with screenwriter Callie Kloves, has crafted a radical, riveting feature sure to engage both the head and heart of appropriately-aged audiences (that is, everyone over 9). For younger audiences, the bedtime-story-come-to-life might morph into nightmare fuel. In this grimdark reimagining (originally titled JUNGLE BOOK:ORIGINS and intended as a Warner Brothers Pictures release to compete with Disney’s photo-realistic retelling), we see Mowgli (Rohan Chand) as a boy caught between two worlds – the human one he was born into, and the animal kingdom in which he was nurtured. After his parents were brutally murdered by vicious, power-hungry tiger Shere Khan (voiced by Benedict Cumberbatch), the small child was raised by wolves (well-mannered ones at that) deep in the jungle. The pack may have nicknamed him “man cub,” yet they still see him as more man than cub. He poses a threat to them, not only because the pact formed to protect him from Shere Khan’s wrath grows more strained each day the boy matures, but also because the animals fear Mowgli’s aggressive, oppressive, destructive human side will take over. His DNA dictates how he will grow and thrive. However, the skills taught to him by his animal guardians – wise black leopard Bagheera (voiced by Christian Bale), Cockney-accented coach bear Baloo (voiced by Serkis), and wolf tribe leader Akela (voiced by Peter Mullan) – will give him a chance to survive. Shere Khan (voiced by Benedict Cumberbatch) in MOWGLI: LEGEND OF THE JUNGLE. Courtesy of Netflix. Thematically, Serkis and Kloves drive Kipling’s points home in an emotionally gripping, albeit shockingly nihilistic fashion. A word of warning: The filmmakers aren’t at all interested in sugar coating these lessons, which is perfectly fine for the tweens and adults watching, but not those who’ve blindly plopped young kids down in front of Netflix. With blood and intense violence, it earns every inch of its PG-13 rating. The worlds Mowgli shuffles between are equally cruel places. His childhood naiveté is progressively ripped away by the dangerous realities of his life. Mowgli struggles with abandonment and isolation as the lone furless family member. Try as he might, he will never be part of the pack. His wolf brothers see him as competition (at least until they need his help asserting jungle law). Baloo and Bagheera are tough on him, putting him through punishing training routines to harden him for the real world. Mowgli deflects his anger and angst onto his best friend, kind-hearted albino runt Bhoot (voiced by Louis Ashbourne Serkis), who also represents ‘other-ness.’ Later, Bhoot provides the haunting, visceral, purposely disturbing, Darwinism-fueled catalyst for Mowgli’s change. Kipling’s commentary on colonialism is represented by hunter/ drunkard John Lockwood (Matthew Rhys), whose lust for animal trophies parallels villainous Shere Khan’s lust for Mowgli’s blood. That said, female characters – like Mowgli’s wolf mother Nisha (voiced by Naomie Harris) and Mowgli’s human mother figure Messua (Frieda Pinto) – are dealt short shrift as the filmmakers lack a connective throughline for the pair. Aesthetically, the visual effects work is awe-inducing. Despite MOWGLI’s shifting release schedule (a two-year wait), the technology behind the effects still looks cutting edge. The audience feels fully immersed in the dangerous beauty of the worlds Kipling originally created. Sound design also plays a crucial role. Shere Khan, with his paw thumping and scraping ominously across the ground, has never felt more threatening a presence. We can feel him lurking around corners, waiting to strike. Slithering seductress Kaa (voiced by Cate Blanchett), an all-knowing, all-seeing snake, entrances and beguiles audiences with her slinky hypnotic charm. 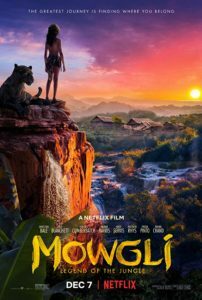 MOWGLI: LEGEND OF THE JUNGLE’s exclusive limited theatrical engagement begins on November 29 and launches globally on Netflix on December 7.